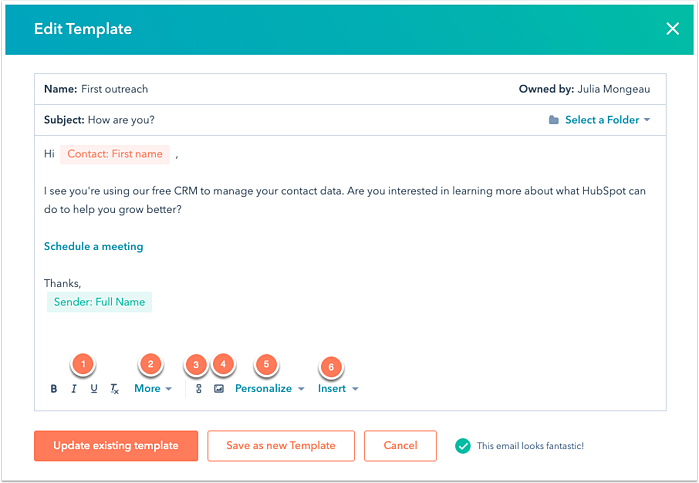 Templates are pre-made emails that you can send to contacts and personalize, without having to type the same content each time. Please note: free users can access the first five templates created in the account. This means that if a free user is added to an account where five or more templates have already been created, that free user will be able to view and use only the first five templates that were created. If there are no templates in the account, the free user can create up to five templates total. In your HubSpot account, navigate to Conversations > Templates. Click New template, then select From scratch. Enter a name and subject for your template. Use the formatting options at the bottom of the editing window to modify the text, add an image, or insert a link. To enter a short, reusable block of text, click the Snippets dropdown menu. To insert one of your sales documents, click the Document dropdown menu. To include personalization tokens in your email template, click the Token dropdown menu. Learn more about adding personalization tokens to your sales email templates. To insert a meeting link, click the Meeting link dropdown menu. Please note: templates must include text. Templates with images only will not attach successfully to your email in HubSpot or your email client. When you've finished creating your template, click Save template. Please note: creating a template with curly brackets instead of personalization tokens causes issues with HubSpot's template rendering service. Before saving your template, remove any curly brackets. After creating your email template, you can use it to send emails from the CRM. In the pop-up box, click Templates. In the dialog box, hover over the template you want to send and click Select. Customize the content as needed, the click Send. The email will be tracked automatically, and the information will be added to your template report data. Learn how to send templates from your inbox using the HubSpot Sales Chrome extension, the Outlook desktop add-in, or the Office 365 add-in.